In September 2009, Tamron announced an update to its popular 17-50mm ƒ/2.8 zoom lens - the addition of an image stabilization system (Tamron's ''Vibration Control'' technology). Initially available only for the Nikon mount, a Canon mount became available in October 2009. The lens is designed for the crop-frame APS-C sensor, meaning it will provide vignetted results if used on a full-frame camera. It uses a constant ƒ/2.8 design. On a Nikon body, the lens provides an effective field of view of 26-75mm; on a Canon body, 27-80mm. The lens ships with a petal-shaped lens hood, takes 72mm filters, and is available now for approximately $650. We noted some slight de-centering with the sample of the lens we tested. Sharpness results seem to be a little poorer than the original non-VC version of the lens; stopped down, it retains its excellent performance. Let's look a little closer. Wide open at ƒ/2.8, the lens shows some definite corner softness, mostly at wide angles. At 17mm, there is a nice central sweet spot of sharpness in the range of 1.5 blur units, but corner softness is significant in the top corners, escalating to upwards of 7 blur units. This is about as poor as it gets through, zooming in towards 50mm improves the corner performance, though (to some degree) at the expense of central performance. By 50mm at ƒ/2.8, the lens is producing images which are fairly sharp (around 3 blur units across the frame), but now are slight-soft corners are in the bottom of the frame, at 5-6 blur units. Tamron 17-50mm f/2.8 VC, at 17mm and f/5.6. As usual, stopping down does improve sharpness performance. However, especially noticeable at 17mm is a bit of uneven focus, which doesn't really go away completely until ƒ/16. We could certainly chalk this up to a de-centered lens element and imagine that a better sample would provide us with better performance. At ƒ/5.6 at 17mm, there is a nice sharp sweet spot in the central range of the lens, but it's still marred by considerable corner softness in the top left of the frame, and uneven focus in the bottom right. Zoomed in, the lens provides a bit more stable performance, and at 50mm and ƒ/8, the lens shows excellent results for sharpness, providing just over 1 blur unit across the frame. Stopping down further doesn't add much, and diffraction limiting begins to set in at ƒ/16. The lens stops down all the way to ƒ/32, providing even, if slightly soft results across the frame at around 3 blur units. While CA is noticeable if you peep at 100%, for the most part it's not a problem. It shows up mostly in the corners when stopped down to ƒ/8 or smaller - except at 50mm, where (curiously) it's more prominent at larger apertures. The Tamron 17-50mm ƒ/2.8 VC provides consistent corner shading from one focal setting to the next - there is some light falloff when used at wider apertures (between 2/3 and 1 full stop at ƒ/2.8, and a half to 2/3 of a stop at ƒ/4, depending on the focal length). By ƒ/5.6, corner shading is very low, with the corners of the image a quarter-stop darker than the center, or lower. Tamron has improved upon the distortion control for this lens. While there is some barrel distortion with the lens used at its widest angle (1% in the corners, 0.6% on average) this is to be expected. The distortion decreases gracefully as the lens is zoomed in to 35mm, evening out to essentially 0% between 35mm and 50mm. Autofocus is conducted electrically, without the use of a mechanical screw. Autofocus speed is fairly quick, producing a slight noise during focusing, but nothing objectionable. Focus speed is not as quick as that seen on Canon's USM or Nikon's AF-S technologies, and isn't as quiet, either. The lens will autofocus on the ''screw-less'' Nikon D40, D40x and D60 bodies. The front element doesn't rotate during focus operations, making the use of a polarizing filter that much easier. Macro isn't much to write home about - just 0.21x magnification, with a close-focusing distance of just over 11 inches (29 cm). 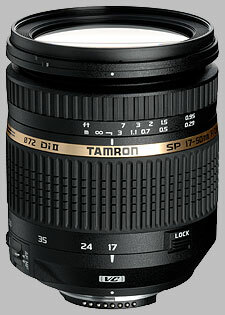 The Tamron 17-50mm ƒ/2.8 VC is composed of mostly plastic, with a metal lens mount. Despite being a lens designed for the smaller APS-C sensor, it's quite a handful, and fairly heavy for ths size. The lens sports an all-black matte finish. The lens has a locking switch for keeping the lens at the 17mm focal length setting. There is a switch to activate and deactivate vibration control, as well as activating or deactivating autofocus. The lens has a distance scale, but no depth of field markings. The zoom ring is the larger of the two, rubber with ribs, just over an inch wide. The ring is very smooth, firm but not too tight, requiring two fingers to move. There is some slight lens extension (1 1/4'') as the lens is zoomed in to 50mm, and owing to this, we didn't find any evidence of zoom creep. It could be as the lens is worn in the zoom could become a little more slippy, but in this eventuality, Tamron has thoughtfully provided a switch to lock the zoom at 17mm. It takes about 90 degrees of turning action to go from 17mm to 50mm. The focus ring is just 3/8'' wide, using the same rubber texture but slightly different ribs. The lens was not really designed with manual focusing in mind, with just 45 degrees of focusing action. The lens focuses past infinity, and there are hard stops on either end of the focusing spectrum. We have done some testing on the vibration control feature of this lens, and we hope to update this review shortly with the results of that testing. The lens hood for the 17-50mm ƒ/2.8 is the petal type, adding an extra 1 5/8 inches to the length of the lens when mounted. The hood is flocked on the interior, and reverses to mount on the lens for storage. The real question most people will be asking is how the new lens compares with the older version. In a nutshell, while the new lens provides vibration control functionality, the old lens provided better results for sharpness, resistance to chromatic aberration and corner shading; distortion is noticeably improved. While the Sigma 18-50mm isn't a constant ƒ/2.8 lens, it does provide Optical Stabilization. It can't offer ƒ/2.8 at the same focal lengths as the Tamron, but where the lenses overlap at aperture, the Sigma is as sharp or sharper - except at the wide end. At 18mm, it doesn't quite match the Tamron. CA performance and distortion control also aren't as good as the Tamron; corner shading is slightly better. There really isn't much of a contest between the Canon and Tamron lenses - for a few hundred dollars more, the Canon lens is sharper, though its distortion profile and resistance to CA is a bit worse. Corner shading is about the same. The build quality is much higher with the Canon, and autofocus speed is much faster. Similarly, the Nikon 17-55mm is a pro-caliber lens. In this case however the Nikon lens does not feature image stabilization, and its results for sharpness, while a little more ''even'' than the Tamron, are not head-and-shoulders better. CA performance is similar, perhaps a little better on the Tamron (in the corners). Distortion is better-corrected in the Tamron. The Nikon fares much better against corner shading. Tamron seems to have had to make some sacrifices to add Vibration Control to its popular 17-50mm ƒ/2.8. It's not bad with regard to sharpness, just not as good as the non-VC version, leading potential buyers to decide how badly they need Vibration Control. no complaints in IQ area. it's sharp, has nice & smooth bokeh look, and also good tonality. It has a solid build (made of good-grade plastics), and heavy. It's a different animal compared to its thinner sibling (non-VC). One of the biggest complaint maybe from the clicking noise of the VC motor. I find it's kinda annoying if I shoot in quiet environment.. but it's just me. for the price (I got mine for $350 used, mint).. it's a GREAT lens. I bought this lens a few days ago. It seems good built, pictures are good quality and sharpness. I don`t like zoom ring, it`s little stiff (at least for me). When you turn on VC, you can really hear it. I have made abot 200 fotos; AF is working good. You can see some test shots I made on f2.8, 4.0 and 5.6 (17mm, 25mm, 35mm and 50mm). Pictures are re sized to 2400x1600. after I received these lens I went to take pictures and all are good, nice focus, fast focus. I had several copies of this lens and all were sharp, with very good sharpness at f2.8, and all were very sharp from f4 onward. With first sample the weakest point is 50mm f2.8, but sharpness is still good at this setting. CA is very well controled, and practicaly non-existant. Distortion could be lesser, but it straightens up easily in post-production in programs like DxO Optics Pro, that also has correction profile made especially for this lens. AF is pretty sharp, very fast in good light, and reasonably sharp in low-light situations, but not as fast as ultrasonic-motor equipped counterparts. Construction quality is good, better than model it replaces, but there are better built f2.8-fixed zoom lenses with better mechanics for sure. But hardly for 465 bucks. For such a price, this lens is simply awesome. I get Canon Err 001 on Canon 40D. Err 001 is a communication problem between the camera and lens. I used the camera in the house for about 3 days without problems, took about 100 pictures. Then went on a holiday and did about 800 shots in 6 days and got the error about 4 times over 6 days. All terminals clean. 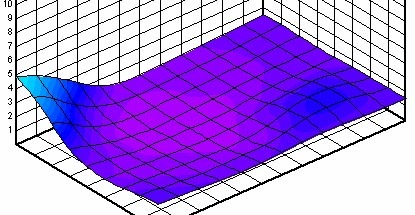 Problem happens on continuous shooting of a moving object while zooming in or out. It is hard to re-produce problem. I bought it from Citywide from Hong Kong over ebay as it is not available in Australia yet, I sent it back but they can’t re-produce problem, It’s been 1 month and still no resolution. Finally Citiwide sent a replacement lens after 6 weeks. No problems with new lens so far, have taken about 1500 photos over 2 months so far. Enjoying VC in low light conditions. I have the non VC model too and can’t notice the softness in the VC model when NOT zooming into picture. Unlike the non VC model, this was made and assembled in Japan. I replaced two Nikon lenses with this one. If you are over lugging around a bunch of lenses-- Look no more! Tamron has hit a home run with this lens! I use this lens on my Nikon D90 and everything works just fine. I use this lens on my 50D. I had the non VC version for a while and I loved it. Then once I borrowed friends VC and fall in love with it. I am thinking of selling the non VC version soon. This lens is way better than my Canon 17-40 L lens. sangat sangat tajam..dan bonus bokehh..
sedikit berisik dan bergetar saat fokus. body juga lebih baik dari generasi sebelumnya, ukuran filter juga sudah meningkat menjadi 72mm, bukaan f2,8 bokehnya dapet...wide juga dapet di focal length 17.
kelemahannya hanya sedikit berisik dan bergetar di viewfinder saat VC di on-kan...terutama saat mulai menekan half shutter dan mencari fokus...terlihat obyek di view finder sedikit bergetar per 1 detik, baru mulai fokus dan siap jepret. tapi all around lensa ini termasuk 3rd party lensa terbaik. I thought for a very long time which zoom lens to buy, tested all variants within 800$ and this lens is absolute champion for now in my opinion. I bought new Tamron and like it a lot. Build quality is much better than previous version and on par with another non-pro zoom lens. When you look and touch it, you really feel what you are paying for. Image stabilization is fantastic. I can't believe my eyes but it gives me 4-4.5 stops advantage on 50 mm. I can shoot 1/2 or 1/3 with crisp sharpness. What I don't like in Tamron's stabilization is significant noice. 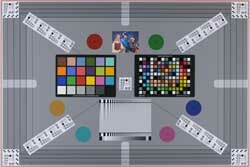 Also the picture in viewfinder vibrates for a fraction of second, but it is not a problem at all. In whole, it is perhaps the best stabilizer I have seen so far. Image quality: good result through the whole frame on f2.8, and excellent on f4. I have a feeling that 2.8 loses a contrast a bit, but possibly I'm too captious. Distortion is visible on 17mm, but it seems to be smaller than competition. Cromatic aberrations: I can't test it in detail, but they are not big for sure. Vignetting: subjectively around 1 EV on 17mm and not visible for me on 50 mm. AF: it fast enough for everyday use and not noicy. What I didn't like is that you cannot override focus. Direct competition has this option. Additional comments: 72 mm filter size makes the lens pretty large in diameter: AF assist lamp is partially blocked on my D5000. Built-in flash makes a shadow. This is expected result, but just in case. Very good resistance to flare. Subjectively the best what I have seen so far. Unbelievably good. 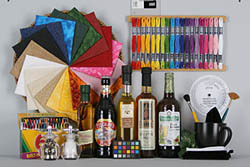 Fast accurate autofocus leads to stunningly sharp pictures with good color rendition. Not that noisy in spite of no USM/HSM. VC story. Doing some tests on soda cans on my desk. Handheld, 50mm, about 2'. Could read the text handheld at 1.3 seconds. Not 1/13, but 1.3. Unreal. Build quality seems good. Zoom and focus are smooth. VC is silent, focus is not silent but not that noisy and very quick. In spite of only being 45°, manual focus seems usable. When shooting video on a the newer crop sensor cameras (mine is a Canon 7D), you need a fast lens because you can't go faster than 1/30 of a second. This is probably the best overall choice. Comfortably the best choice. Note, it is not as light as my Nikon manual focus primes. They are also faster and may also have a better image, however this Tamron is as close or maybe better. This lens is much better than I expected and just excellent overall. I use this lens on a Nikon D300S. I have previously used the Nikon AF-S 17-55 f/2.8, and the Tamron 17-50 f/2.8 (NON-VC). The lens is very sharp and works every bit as well as the previous non-VC version, if not better in every aspect. I have no concerns with the sharpness wide open, contrast is excellent. It has a bit more CA then the Nikon 17-55 and just doesn't have the corner sharpness of the Nikon, but otherwise is a near match. Its fast to focus and accurate on my D300S. From time to time it will focus incorrectly, but it is not often (maybe 1 out of 50 attempts). However this lens was a bit less 'rosy' on a D90. Focus is bit slower, especially in low light. The difference between the focus speed of the Tamron and the Nikon are more evident with the D90, than the D300S. While I am sure many will disagree, this lens has allowed me to part ways with my Nikon. The easily digestible $625 (after rebate) price and 6-year warranty have made this lens my new primary lens. I wouldn't hesitate to recommend this lens to anyone. focus ring moves during AF, soft case/pouch not included. This is fantastic lens, period. The lens is sharp right off the bat at f/2.8 (particularly at the telephoto end on my sample). So it's fully usable wide open. Stop down to f/5.6 and it becomes truly spectacular -- sharp, sharp, sharp and great contrast. Very happy in the sharpness and contrast department. The amazing thing about this lens is the VC (image stabilization). I can shoot at 1/4 sec shutter and get crisp images at 50mm. Truly amazing. Coupled with the sharp wide open performance and it's a winner. The VC makes a high pitch noise every, but nothing to be concerned about. Very effective, as good as or better than Nikon's VR. AF accuracy is good, but not as good as Nikons which alway seem to nail it right the first time. Once in a while AF will be slightly off, but nothing bad. AF speed is fast, and now almost silent. The lens is well-balanced on my D300. The zoom ring is damped just right. There is no zoom creep, but then again, the barrel only extends out about an inch and a quarter. There's a lock switch to keep the lens at 17mm just in case. The VC version is noticeably bulkier girth-wise than the non-VC but doesn't weigh that much more. It is amazing how light this lens is for what it is. Construction is good -- not in the same league as metal Nikon gold ring lenses -- I would say it is on par with Nikon consumer lens like the 18-200VR. But it is better constructed than Tamrons of yesteryears. No complaints. Mine is made in Japan. This lens takes 72mm filter. My only gripe is that the focus ring moves when it's autofocusing (like the non VC) and you can't just grab the focus ring to do instant manual focus like on most Nikon AF-S. The Tamron does use built-in motor for AF so it's compatible with motorless Nikon DSLRs like D40 and D5000. I was originally going to get the Nikon 16-85mm f/3.5-5.6 which has a loyal following for its excellent IQ. Someone told me to check out the Tamron 17-50 non-VC which can be had for about 31,000 yen in Japan -- about half the price of the Nikon. I was leery of Tamron, having had bad experience with their original 28-200 ages ago. The reviews for the 17-50 non VC have all been very positive. It was a no-brainer to get a faster lens for less money. I ended up going with the newer VC version for about $200 more than the non-VC. The VC version lists for 70,000 yen (73,500 with tax) and street price is around 50,000 yen. Some may argue that the extra money for VC is not worth it for a lens of this focal length and speed. IMO having VC even on a lens like this is definitely a plus. Never thought I'd buy another Tamron in my lifetime, but I'm a believer! You will not be disappointed with this lens. It will give the Nikon 17-55 a run for the money, a lot less money. As with any lens, I recommend you buy from a local store and bring your camera to test before you walk out. Each copy is different.